1. Editorial cartoonists often use symbols to represent a person, group or idea. What does the elephant represent in this cartoon? 2. What does the man the gorilla is holding represent? 3. What point is Glenn McCoy making in this cartoon? 4. Name the (original) movie the cartoonist is using to illustrate his point. 1. The elephant represents the Republican Party. 2. 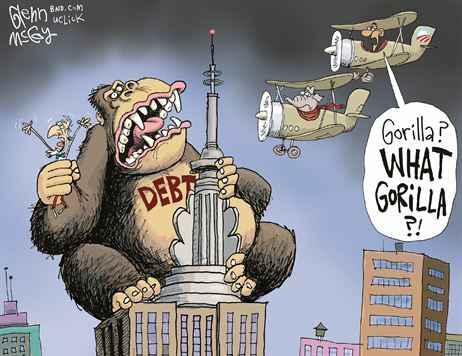 The man the gorilla is holding represents d) the American people. 3. The American people are held captive by debt, but President Obama is ignoring warning from Republicans in Congress that debt will destroy us.